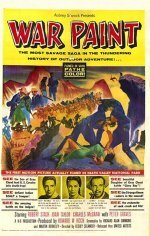 Boasting a strong leading performance by Robert Stack, a tense and involving plot, and stark desert locations in Death Valley, this is a notch above average among cavalry and Indian westerns. The grim drama centres on the efforts of Stack's lieutenant to deliver an urgent peace treaty to an Indian chief. He finds himself up against sabotage within his patrol, lack of water, and a rebellion over gold. The steady pace is disrupted only by a campfire song interlude. A courageous US cavalryman is given a vitally important mission - to deliver a peace treaty to a powerful Indian chief, preventing further conflict. However, a band of bloodthirsty rebels are determined to see him dead before he completes his task, while the officer's guide may not be as trustworthy as he appears.